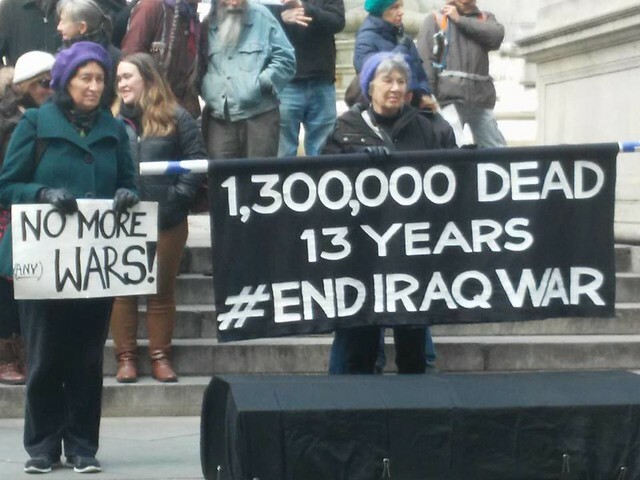 On Day 1 of the CODEPINK #IraqTribunal, participants provided testimony on the lies that were used to invade Iraq. After 14 years of costly war based on lies, it’s time for truth and accountability. The People’s Tribunal on the Iraq War will unify the global anti-war/peace movements with other justice movements by uplifting testimonies of the costs of this war – and war itself. The Tribunal will bring the lies that created the war on Iraq into public awareness, while demanding Obama act on them. It will build and inspire the anti-war movement that we will need after the inauguration of the next administration in 2017. It will be a tool that all groups can use to build, inspire, and enliven their organizations and communities. This entry was posted in All Posts News Politics and-or Videos, Anti-war, Dandelion Salad Videos, Depleted Uranium, Human Rights, Imperialism, Iraq, Iraqi Dead (1,000,000+), Politics, War Crimes and tagged Chris Hedges, Daniel Ellsberg, Helen Caldicott, John Kiriakou, Vijay Prashad. Bookmark the permalink. Thanks Lo, I posted Vijay Prashad’s testimony on my fb. What does a ‘plutophilic’ empire do that has attempted to gain everyone’s everything only to discover it has achieved nothing but the loss of its soul ? I’d say it’s high time to outgrow these kindergarten fantasies of parochial empire and dream of galactic meta-community, of cosmopolitan, indigenous, star-embedded civilization…. If interested, click on Codepink’s Youtube channel and see many more videos from the Tribunal. I remain of two minds. Good to speak up. Now that you have done so, so what? Are the tyrants less secure? Is the public more outraged? 53 years ago a President was cut down like a dog in Texas by the Deep State. Play all you wish but the Deep State remains. Gladio never ended. And Ellsberg of course knows this, but that too does not really matter. Changing one whip hand for another for 53 years does. To make the People happy said Goya, lash them with guns.